Alex J. Cavanaugh: Ninja Back From Vacation! Carol Kilgore and the Tiki Hut Invasion! New Book Releases and Cover Reveals! Movie Trivia Answers! Dogs and Cats, Living Together… Mass Hysteria! Ninja Back From Vacation! Carol Kilgore and the Tiki Hut Invasion! New Book Releases and Cover Reveals! Movie Trivia Answers! Dogs and Cats, Living Together… Mass Hysteria! I’m back from vacation! Did you miss me? I was able to get online more than anticipated, but I know I missed a lot of awesome stuff from you guys. And I aim to make it up to you this week! And my special Challenge Participant Feature interview at the A to Z Blog today is Golden Eagle! Be sure to stop by and hear about her topic for the Challenge. Am I really here? This is Alex J. Cavanaugh's blog, right? Oh. I guess I should tell you who I am and why I'm here. My name is Carol Kilgore, and I blog over at Under the Tiki Hut. There's no beach here, like at the Tiki Hut. I see space – planets, stars! And that funky-looking meteor that just zinged past. A LOT MORE OF YOU are moving around out there than at the Tiki Hut. I recognize some of you, but I see new faces, too. The reason I'm visiting Alex today is to recruit Cassans for tell you about my debut novel. 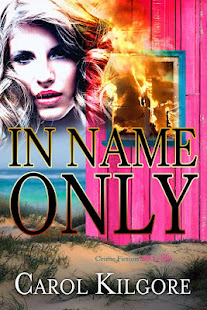 IN NAME ONLY is just like nothing at all like Alex's books. The story is about Summer Newcombe, a woman caught up in the Federal Witness Security Program, and how she fights back. She's just been relocated to Padre Island and has no real home, no family or friends, and no place to hide from those seeking to do her harm. There are spaceships and epic battles is a Beach and a Kayak, a Hot Firefighter, an Older Woman with a Tiny Dancing Dog. And Guns and Roses. Not the band. And more. Oh yeah…there's also a plot with a young woman in danger. If she's more at home with guns than roses, that's because she wants to stay alive. On earth. I tried to place her on Tgren, but Alex beat me to the punch. IN NAME ONLY is available at Amazon in both Kindle and print editions. Jessica Therrien is the author of the young adult paranormal fiction series Children of the Gods. Book one in the series, Oppression, was published by ZOVA Books in February of 2012 and became a Barnes & Noble best-seller shortly after its release. 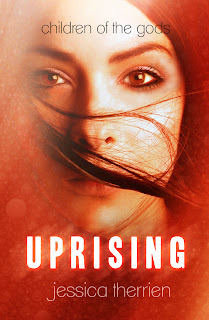 The second book in the series, Uprising, will be available in February of 2013. Purchase it at Amazon, Barnes and Noble, or Smashwords. Susan’s epic fantasy is now available on Amazon for only $2.99. The first book of this series, The Keepers of Sulbreth, Book #1, is now available everywhere for only .99 and the second book, Beyond the Gate, Book #2, is now only $1.99. Stephen Tremp’s Breakthrough is free through Thursday on Amazon. And don’t forget to sign up for my Genre Favorites Blogfest on September 17! Whoa! I really shouldn’t take off for that long. Any questions for Carol? Excited about the new covers and book releases? Did you sign up for my blogfest? Get the trivia questions right? Be sure to visit Golden Eagle at the A to Z Blog. And wonder just what Ninjas do on their vacation…? Hope you enjoyed your vacation, Alex! I'm sorry... you said your name was Alec? Nice to meet you, Alec. Welcome to the Blogisfear. They're a nice bunch here. Do be wary of the one fellow with, like 400 Borgs working for him. He seems to visit every blog by 9 a.m.
His name sounds like yours, it's A. Lex Cavendish, or something like that. Anyhoo, I'm sure you'll get a follower or two - one of these days. Welcome back, Alex. Yeah, I do wonder what Ninja's do on vacation. Hope you had a wonderful time with your wife,whatever you guys did. Welcome back! Where were you? I hope you enjoyed your vacation. Welcome back Alex, hope you had a great time. Some cool book covers around at the moment. Congratulations, Carol! Your story sounds wonderful and I wish you lots of success. Welcome back Alex, and yes we did miss you! Hope you had a great break, it looks like busy times ahead. Indie covers just keep getting better! There's a lot of good reading selections listed above! Dang. That's a lot of cool books. Welcome back. I knew numbers 1, 2 and 5 of those questions. Probably because I have seen those movies more than once. Moody, no still pale as a ghost. Mark - hilarious! I'll watch out for that guy. Karen, we had an awesome time. Thanks everyone. Happy to be home! Yea Carol! I enjoyed In Name Only. Summer is a strong and engaging character! Gosh we missed you! So happy to see you back! Carol, your post was funny (that's how I'd feel guest posting here, too) and all the books featured here today look hugely interesting. Best of luck to all! I love the cover for UPRISING. And the cover for WEIGHTED. And FORGED. I guess I'm just a cover whore. Hi, Carol! *waves* You sure do get around. Wow, lots going on. I like that cover for Forged By Greed. Alex, thanks so much for sharing my new release!! I hope you had a great vacation. Welcome back. Welcome back. Hope you enjoyed your vacation. There's some great new books out there. Welcome back, and congrats to Carol on her book release. I wish her the best. Suzanne - I totally agree about cool bookcovers! Sean and Cindy - A lot of great artists and designers are getting an opportunity to show off their work. Congrats to all the new books coming out! Cathy, you are welcome to invade anytime! Ciara, you're welcome, and sorry a day late. Carol, very happy to host you! Dang, I missed the trivia questions post. I would have gotten several of them. The "Aliens" quote is my favorite of the bunch. Welcome back, Alex! Hope you had a nice time away! Ciara - More waves :) It's great to be sharing space here with all these other great books! Miranda - I love all these covers, too. Glad to have you back Alex! Hope you had a great time away! Hoping your vacation was AWESOME!! Yes. I do wonder what Ninjas do on vacation. Those book covers are awesome and congrats to Ciara and Susan! I hope you had a nice vacation. J.A. and Angela - Good to see you here. Yup, missed seeing those little radio telescopes. What a bunch of great looking books! And Carol, your book sounds like quite a ride. Congratulations! Wow, beautiful covers. Congrats to Jessica and Angela! Yay for Carol! Her book is on my TBR list - can't wait to dive in. I hope you had a great time on your vacation, Alex. Loved your guest post, Carol. That cover for UPRISING is stunning. I hear that there is a sequel to INDEPENDENCE DAY in the works. Hard to see where they could go with that with the original actors. Welcome back Alex! Glad you had a nice time on vacation. Great job Carol! I love your breezy style... awesome book cover, too. Hope you had a good time on your vacation and your back is with the batteries fully charged. Angela, covers are all cool, aren't they? Roland, I am merging and catching up. And I think too many years have passed for an Independence Day sequel. LOL! Alex, you're amazing -- you were around even when you were 'on vacation'! Well, I hope you had a fabulous vacation, even when you weren't being Ninja Master of the Innerwebs! Great post, Carol! I wish you much success with "In Name Only"! ...And I got all the trivia except Stallone and Demolition Man. Never seen that movie -- is it worth checking out? Love Carol's post and her description of her book!!! We missed you . . .but vacay's have to happen for sanity and happiness! Hopefully you spent lots of time with your wife . . walked on a beach, watched comets, something romantic, or jammed on your guitar. And yay, I got a few of those trivia questions right! Oh yes, I did miss you! Are you gonna tell us where you went? You are such a sweet guy, supporting so many of your author friends. We're lucky to have you! Wow! So much going on over here :) Thanks so much for posting the cover of UPRISING! It was awesome to see Ciara's new book and Angela's cover as well. Everyone is busy busy busy. Thanks again. Great interview Alex. That Demolition Man quote is one of my favs. My favorite is "Wait. This is the future. Where are the phaser guns?" Leovi, I am charged and ready! Chris, it's a stupid but fun action flick. Sandra Bullock is cute in it. Tyrean, I did enjoy myself. And yes, I took my guitar. Can't go a day without practicing! Thanks, Nancy! Headed north. Bit of a road trip, and yes, we did stay at the beach two days. Jessica, you're welcome. And I know - busy week. Lulz. Gotta love Will Smith quotes. I'm reading IN NAME ONLY right now. So great! Congrats to Carol! And welcome back! Hope the vaca was fab! Congrats Carole and all the other writers with books launching this week. Some really STUNNING covers out there... especially Ciara's. Welcome back! I did notice you popping up at intervals on some blogs. Just can't resist, can we? The blogfest is looking good, although I'm still trying to figure out my faves, since I have a few. Lots of new books coming out, good luck to all! Melissa - I like Galveston, but I LOVE Padre! Roland, kmckendry, Julie - Thank you. Y'all are kind. Julie, if you lurk well, you are a Ninja! I hope the break was good for you. I haven't decided about the blogfest, yet. I'm not sure if I have anything for it. Welcome back! Glad you had a nice holiday. And yes, I do wonder what Ninjahs do on them. Those are some nice book covers. 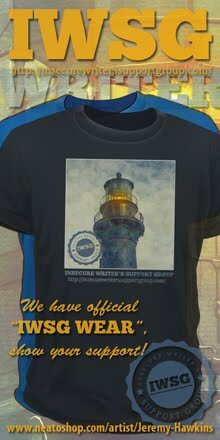 I especially like "Weighted"s. But then again, I do have a thing for clocks. I should have know that Star Trek quote. And the Aliens one. My dad likes Aliens. Welcome back Alex! Did ya have a great vacation? Hi ya Carol. A Tiki bar in space would be an awesome vacation. Great post from Carol and awesome book covers. Mass Hysteria - that made me grin. So glad you had a nice vacation. Everyone missed you, and it's good to have you back. Congratulations to Carol, Jessica, Susan, and Ciara on their new novels. I am promptly putting all of them on my TBR list. I'm off to Golden Eagle's blog now to read the interview! Vacation, you had time for a vacation! Lucky, lucky you. Only quote I recognized was from Independence Day, but I swear I saw all those other movies. It's not age, it's just memory overload -- yeah, that's the ticket. LOVE the Blade Runner quote. Will Smith's pretty good too. Wow your post have given me a lot of reading to think about. And thanks for looking at my pics. Awk, so many books, so little time. I'm very intrigued by these plot lines, especially Carol's. Hope you had a great vacation, Alex. Chris, Tyrean, mshatch - Thanks. Nice to meet you! Emily - Cool :) Happy you're liking Summer's story! Michael and D.G. - Thank you. Heather and Angela - Thank you! It's so nice to see old friends and meet new ones here. I'm not a Ninja, so it may take me a few days to get to all your blogs, but I'll be there! Andrew, you don't have any favorites of anything? Ninjas like food. And other treats. Won't say anymore! Angela, it was a busy week! Yolanda, I know the feeling. Morgan, yeah he wins comment of the day! Love the book covers for both Uprising and Forged by Greed. Nice book review and suggestions- thanks. Hope you had a great vacation and glad you are back. Did you have fun on vaca? I hope so. You deserve it. Wow Jessica's novel is gorgeous! I'm heading over to check out the A-Z blog. As always, Carol is a hoot. Love the cover on Uprising. Weighted is on my TBR list. I just love the covers from all the books. They're amazing. Carol, I hope you're having a great blog tour. Every time I think I'm about caught up on my reading, you always introduce me to new books to read. I'm not complaining though! You are too funny, Carol. Great post! Wow, great covers on all these books. Welcome back, Alex! Hope you had a wonderful relaxing time. Wow, thanks for mentioning my new release. It's doing pretty good out there. I had my usual one trivia question right. No vaca at our house. Too much college stuff to get ready for financially. Pat - No complaints from me either. Christine and Cate - Thanks! Nutschell, she's clever that way. Pat, they just keep coming out. 1. Carol's post was hilarious, and I can't wait to read In Name Only. 3. Congratulations to Ciara and Susan! 4. I already own Breakthrough, but that's awesome! 5. On my way over to the A to Z Blog. I wondered where you were. Glad you had a nice vacation! Lots of great stuff going on with the other ninjas. I'll stop by some of their blogs. Welcome back! Welcome back. I follow Carol's blog so I've already got In Name Only on my TBR list but I loved her post here. Wow, that's a lot of stuff. Welcome back. Hope you had a great vacation. Love the covers and the books sound great. Carrie and LD - Thanks! Oh, and I think I forgot to welcome Alex back. So welcome back to your blog, LOL! Carol has such a wonderful sense of humor. Her book sounds really intense, despite the lack of spaceships. Hope you enjoyed your vacation. Fitting that Carol should be here withi the Tiki Hut upon your return. Sure did sign up for your blogfest. Giving it a shoutout on Friday. Wow! So many books! Overwhelming for a slow reader like me who's also trying to keep up with blogging among other things. Where to start? At least I've already read Breakthrough a couple years ago and anyone who hasn't yet should take advantage of the free download. Whew! Life is going too fast. Carrie, you covered it all well! You step away for a break and all kinds of things happen in your absence. You did notice I hijacked your blog for a few days, right? I'm going to the beach right after this to steal a look at Carol's book. I see Stephen's book is free. I've already purchased it! Oh well, glad I did because I enjoy reading it and review ing it and now I know what happens. Capn Ninja!! While you were away the Ninja's did play!! Yay for lovely Carole coming over to sprinkle some sand, sea and Summer!! What a star!! Did someone say hot firefighter? Carol thought of everything; her book sounds great. The others look and sound great too. I'm always (and increasingly) impressed by the talents in blogland. Thanks for all the info, Alex. M Pax - So Alex gets a vacation blog when he returns from blog vacation - LOL! Arlee - I'm not the fastest reader either. Books are piling up on my Kindle. Lee - Come to the beach anytime! The Tiki Hut is nearly always open. Good luck with your Alligators! Love Carol's post/description! Clever and amusing. Hey! I got three right! Glad you had a great vacation. Welcome back! What do ninjas do on vacation? They sharpen their throwing stars, right? Many great books, cover reveals, and new releases. Woot! Sadly no trivia questions for me this week. I haven't watched any of those movies. Something is telling me I need to watch more movies. Am wondering what ninjas do on vacay . . . hopefully rest:-) I love when I'm absent from school and my students ask where I was and I answer, "Where do YOU think I was?" Their guesses are sooo funny! I have Stephen's book on my Kindle and it is next on my read list! Read the Eagle's post and still am impressed with how smart she is...ready for the blogfest. Lynda, yeah - that's it! Imogen, they are older movies, so no pressure. Jamie, that would be fun! Chuck, she is scary smart. Welcome back Alex. Hope you had an awesome vacation. Great to see you back and promo-ing so many books. hope you had a nice time on vacay! lots of great news! thanks, as always! Denise, I'd forgotten how many until I put this post together! TF, wish I could say that. Welcome back. Hope you had a wonderful vacation. Very interesting book by Jessica Therrien. Greetings. Hope you enjoyed your vacation:) Also, I love the Aliens quote...Ripley rocks! Welcome back from vacation Alex. And thanks for the shout out! Good luck to Carol and In Name Only! And to Jessica and Angela with their upcoming releases. Fun guest post. :) Spaceships and battles or no, In Name Only still sounds like a great book! Thanks again for having me over at the A-Z blog, Alex! After so many comments, it's amazing you even make the time to read mine, but, welcome back from vacation. Mine is still looming in front of me shouting, "Hurry up and visit. I can't wait to see you again!" Oh, I wanted to say thanks for visiting my blog and leaving your comments. My newest manuscript's MC name is Alex. His full name is Alexander. Hmm. Coincidence? Thank you for cluing me in to some great reads! I'll have to check out Carol's book. I hope you had a fab vacation, Alex. Lynda - Thanks for the yay! Stephen - Thank you. All good luck wishes gratefully accepted! Jemi - WOW! I'm humbled. Thank you for such great support. Golden Eagle - I appreciate your kind words. Jennifer - Alex is great about supporting writers. Great stuff going on and congrats to Carol! Congratulations to Carol! I'll have to stop by her place. Thanks Stephen for the book. I'm definitely going to go get it. Wonderful to read Carol's guest post and all those beautiful new books! I've seen most of these books floating around the blogosphere lately. That's great! Congrats to all. I really like Jessica's cover. Ink, no coincidence - it's an awesome name! Thanks, everyone - happy to be back. Some of those cover designs are really lovely. wow - love those covers! Very eye catching! Good to have you back, Alex. Golden's science posts were really interesting and well explained. Nice interview. Entertaining post from Carol - the book sounds great! I also agree with those who said (no, I haven't read every comment) that those are some really nice covers! Gwen - The Tiki Hut is always open. Unless it's closed, LOL! Susan - Gotta get out and about! Patsy and TerryLynnJohnson - I think all the covers are lovely, too. Nick, the comments are twice as long as my post! I'm glad you're back. Great trivia last week. There are some beautiful covers there. Great stuff all around. Damn, I need to write a book so you can promote me. I feel left out of this writers circle you have. Hope you had a wonderful vacation! Missed you!!! Signed up for your blogfest. Welcome back! Yes, that's a lot of stuff to catch up on! Congrats to everyone with new books out. PTM, you don't have to be an author. Really! 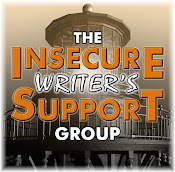 I just promote my blogger buddies and their achievements. I'm enjoying Carol's novel. I should be done with it soon. I love the cover reveals. Medeia - I'm glad you're liking it! Medeia, glad you're enjoying it. Michelle, that is too cool! Whew, that's one long post title Alex. I like the cover for uprising. Hope you enjoyed your vacation. Alex - Thanks so much for hosting me. I had a great time, and I loved meeting so many people, seeing old friends, and making new ones. The Tiki Hut is available for you anytime. I adore that Spok quote from Star Trek II. I was watching a marathon the other day and was reminded all over again how much I love him.